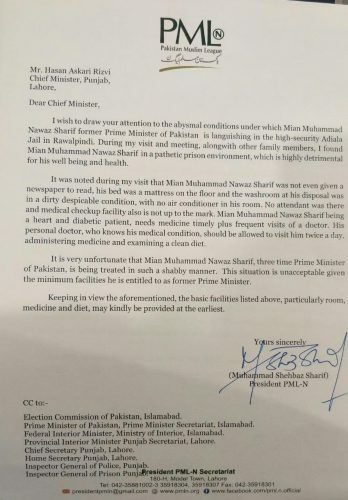 ISLAMABAD (92 News) – PML-N president Shehbaz Sharif has written a letter to Caretaker Prime Minister Justice Nasir-ul-Mulk, seeking facilities for former prime minister Nawaz Sharif as per his privilege. He said that Nawaz Sharif is a heart patient and his continuous medical check-up along with medicines should be ensured. “Nawaz Sharif has been provided a mattress instead of a bed. He has not been provided an air-conditioner,” he said. The PML-N president complained that the condition to bathroom is very bad. He said that Nawaz Sharif is being kept in a pathetic environment that is detrimental to his health.